Louisville ranks ninth among its peer cities with 12.4% of young adults holding a graduate or professional degree. Where in are graduate degrees holders concentrated? 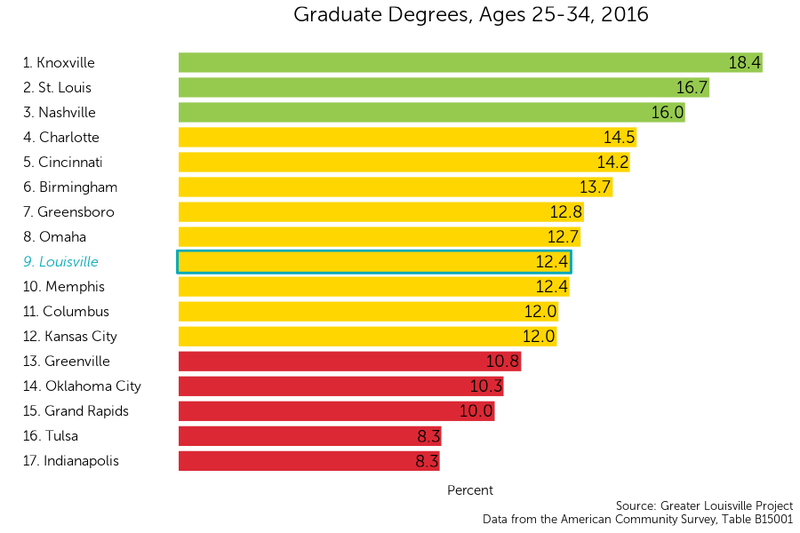 Although, Louisville ranks 5th out of 17 cities in earned graduate degrees or higher among young adults, there is a clear geographic divide on where those people live. In the map to the left, areas where more adults have associate’s degrees or higher are purple, while areas where fewer adults hold associate’s degrees or higher are white. High attainment of graduate degrees is almost exclusively seen in northeastern Louisville, among communities such as the Highlands, Butchertown, and St. Matthews where the highest percentage reaches 60%. In comparison, western and southern Louisville communities earned fewer post-secondary degrees, with the lowest rate being 1% in Portland. Scroll over the map to see values for each census tract. Zoom in to see street names that form that boundaries of each tract. Louisville has experienced a fairly steady increase in earned graduate and professional degrees since 2006, with only one small decline in 2010. The increase in degrees has kept track with our outpaced its peer city average, and Louisville has consistently been close to the 75th percentile of its peer cities.